Finally – fine dining, paired with beautiful beers, can now also be done in Amsterdam. Copenhagen, San Francisco, Brussel and New York have been having it for years. 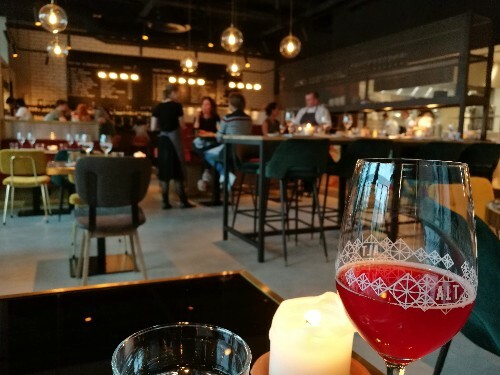 Amsterdam did have a few places taking beer seriously: Lieve (now Spingaren) and Restaurant Dwars, where chef Jo Vaessen worked with local ingredients and dito beers. Perhaps they were ahead of time, like the cancelled Beer and Gastronomy Award. That can make a comeback: Bar ALT is more than a serious contender. 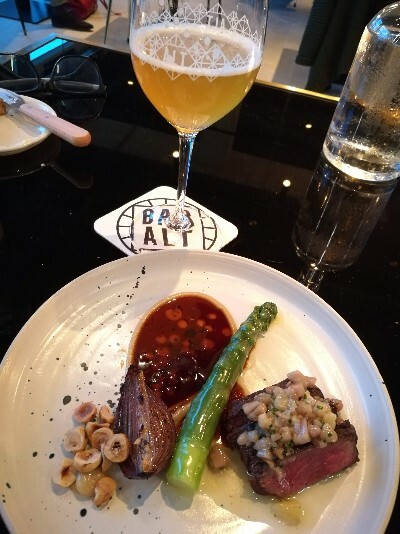 Bar ALT places the bar high: fine dining with matching beer. On tap it boasts 21 brews, mostly by small and independent Dutch breweries. The bottle selection adds up to around seventy – mainly international. 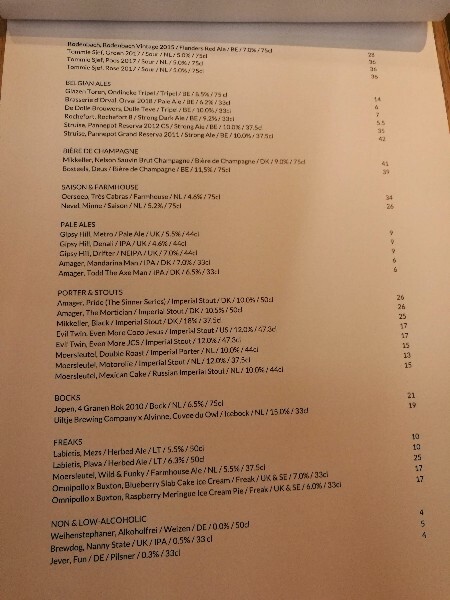 For those persisting in not drinking beer, a fine selection of ‘natural wines’ – call it craft wine, if you wish. 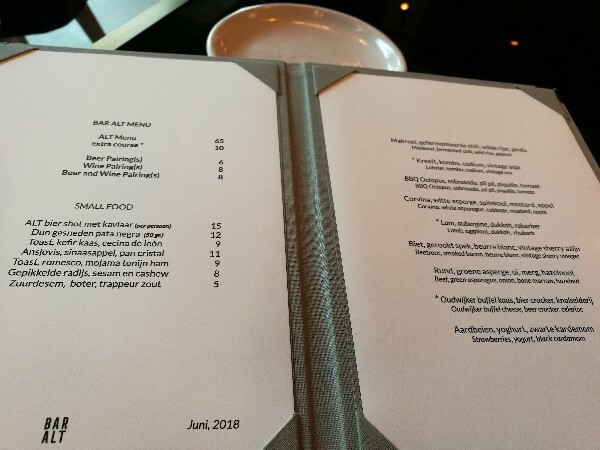 The menu now lists nine dishes, to be ordered in a six-course menu, costing € 65. Every added dish is another € 10, the beer match comes at € 6 a glass. 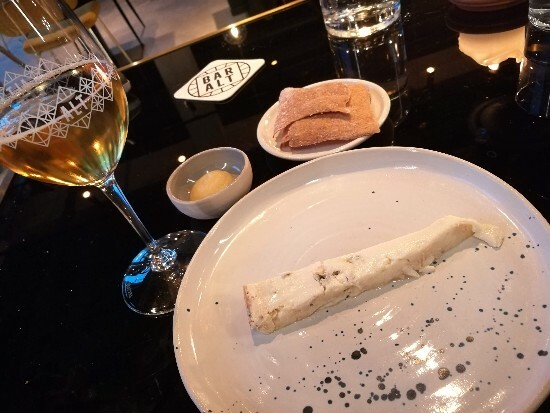 Both a beer and wine pairing comes at € 8. Glassware is bespoke and suits all needs and drinks. Bar ALT is a joined venture of the guys behind Restaurant Jacobsz and Two Chefs Brewing. 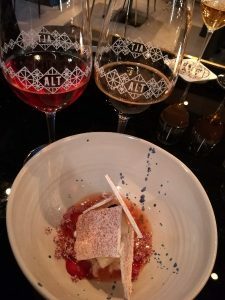 This brewery was founded in 2012 opgericht by Sanne Slijper and Martijn Disseldorp: they met behind the stove and were planning to combine their love for great food with their love of great beer for quite a while. Most of the draft beers is Two Chefs. 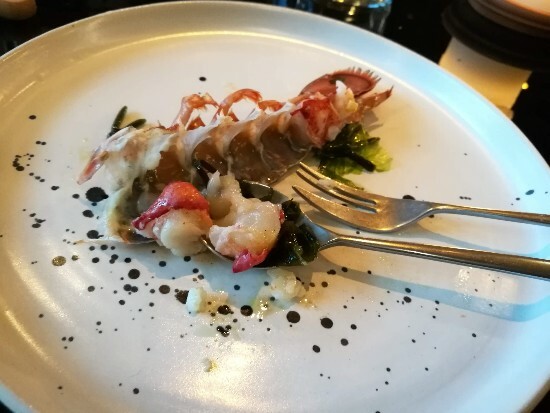 The kitchen is headed by Chef Thomas Kooijman and Jacobsz’ Rick Swinkels, resulting in clever made dishes which are beautifully styled. See examples in some the pictures here and at the bottom of this page. 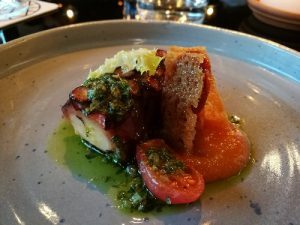 I dined at Bar ALT, hoping for the best, expecting possible challenges. 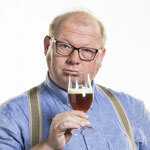 Reason is, it easily goes wrong when pairing food and beer – regardless of the culinary level. Personally I believe beer, as wine, should be an accompaniment for the dish and not more than that. Who wants beer to take the lead better seeks out a decent bar. Local newspaper Het Parool quoted the chef saying he’d adept a dish to a beer if needed. It made me want to scream ‘no, don’t!’ – food comes first, and if the match is wrong, change the beer. So, the combination of high bar and potential trouble made me both extremely curious and a little weary. I was not disappointed. Nicely decorated, well-chosen music and fitting decibels, comfortable chairs and couch. Sure, one could complain the tables are a bit too high – but one can always complain. There are high tables too, particularly for larger groups. Staff is crisp, knowledgeable and oozing expertise without becoming threatening. Very un Amsterdam, if you get my point. Since I had high hopes and no further obligations I asked for the full Monty: all nine dishes with a beer pairing, if you please. I will not bore you reading the entire menu (see somewhere down this page), but some combinations deserve a special mention. For example the BBQ’ed octopus, paired with Rodenbach Vintage 2014 – well-nigh perfection. 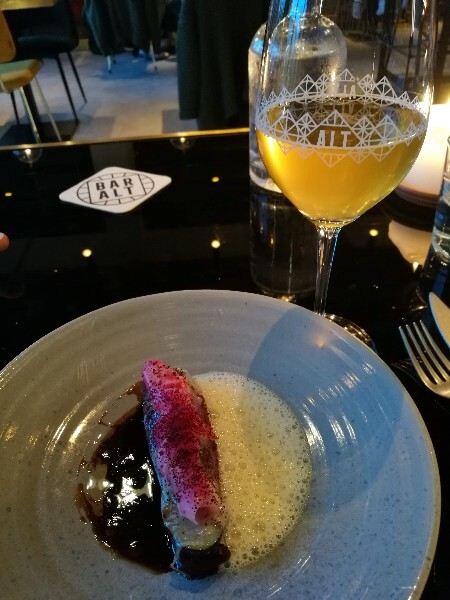 The first dish did not convince me: mackerel with fermented chili, wild rice and peanuts came with a saison and did not match. Partly because the saison was not a saison, showing a lot of malt sweetness. The fish was just begging for a wit beer. 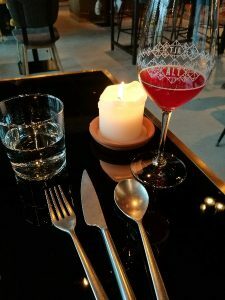 Dish six, however – beetroot with smoked bacon, beurre blanc and vinaigrette of vintage sherry vinegar paired with Oersoep Très Cabras – was a moment of totala happiness. Heaven’s gate opened itself, briefly. 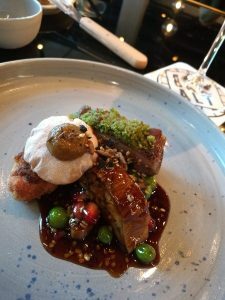 Other great combinations were Uitje Brewing Company Mosaic Mammoth with lamb, eggplant, dukkah and thymus – one would think this combination was destined to go nowhere, but think again – awesome. Beef with green asparagus, melted bone marrow and hazelnut came with Jopen Witte Rook (‘White Smoke’): heavenly and earthy united in total bliss. What upperhand has beer over wine? The carbon dioxide gas cleanses the mouth with every sip, preparing for another sensation. The total flavor complexity of beer is roughly seven times larger that wine. Bitter comes in many versions: sparked by malt, hops and sometimes spices – where wine only derives it from tannins. Sour ales get their complexity from the microflora in the vessels they mature in, and sometimes from fruits or added lactic acid. 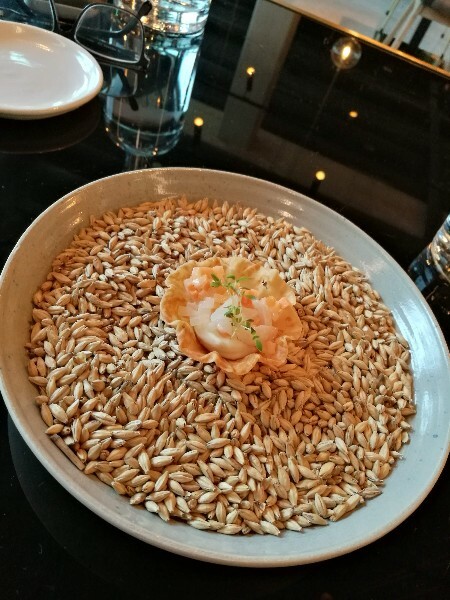 Wheat may contribute it, totally different sours. 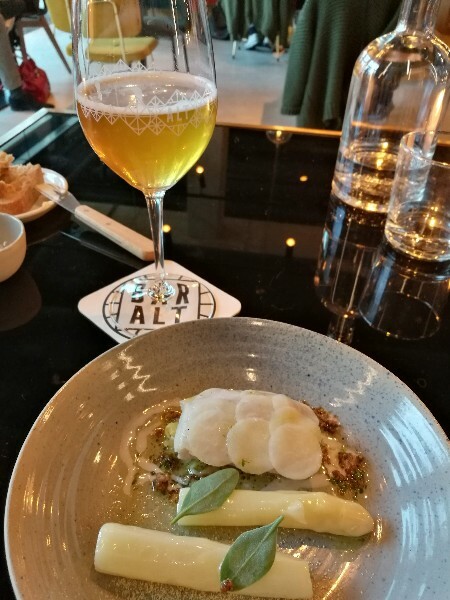 Bar ALT’s beer menu is a careful selection of sours, with a lot of saisons – a beer style extremely well suited to pair with food because of its dry and earthy character. Rare bottles, often from unique and limited brews, complete the eclectic beer selection. 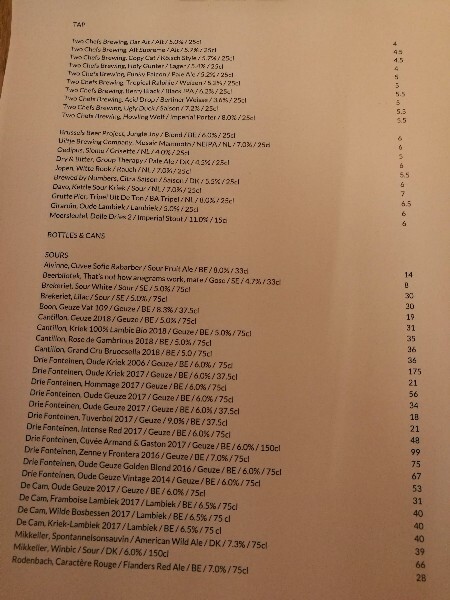 What truly speaks for Bar ALT is them investing in a fulltime beer guard: purchasing, selecting and curating the selection is done by sommelier Wiard Siccama, who’s also around to explain about the combination and the beers themselves. The fun he has drips off his face and I could see him push you out of your chair so he can have a go at it himself. I’d welcome him to it! All in all I believe Amsterdam has welcomed a new jewel in the crown. Yes, interpret that as a wholeheartedly meant advice to go there and indulge yourself – even if you’re not particularly into beer at the dinner table. When I visited, a mother-daughter couple sat beside me, savouring the dishes and having them paired to wines. The Omnipollo Raspberry Meringue Ice Cream Pie I had with desert changed their mind: they finished their sweets already but shared a bottle of it between them. And loved it. It was the final push to make a great evening into a perfect one. Asparagus and stuff. Good stuff!